The Southern Watch fencing unit could once have been called the Dame Vivienne Marie de Beauvais Fan Club. Don Quinn, Dona Emily, and Don Bastiano. Photo by Arianna of Wynthrope. According to Don Bastiano di Jacopo, the unit began almost 20 years ago in St. Swithin’s Bog in honor of Dame Vivienne, who was the first peer made in the Bog and is a former Baroness. “We were a ragtag group of fencers, not winning tourneys, none of us White Scarves, but we decided to form a team in Vivienne’s honor,” said DonBastiano. Don Quinn Kerr continued, “After teaching ourselves to fight as a unit, we went on to beat larger teams with better fencers, because we were focused on teamwork. That’s how the Romans ruled the world – they were all about teamwork.” The Bog’s fencers gained a lot of attention with their victories, and the results were clear at Pennsic 32 when a Rapier Battle was included in the War Point count for the first time. Later, Don Donnan the Solitary, then Æthelmearc Rapier Marshal, asked the fencers of the Bog to form the nucleus of what is now the Southern Watch, which includes fencers from throughout southern Æthelmearc. “As time went on,” Don Quinn commented, “Fencers from the Midrealm would come to the Southern Watch musters to learn unit tactics from us.” Don Iago Benitez, current Baron of the Bog, added that individual Southern Watch members have gone to events in other areas and trained their fencers in the group’s unit ideas and commands. This year, on the Saturday after Thanksgiving, 16 fencers from the Bog, Steltonwald, Debatable Lands, Silva Vulcani, and Sylvan Glen gathered in Don Bastiano’s Johnstown, PA loft for their annual muster. According to Doña Emily of Dunvegan, the fall muster has been held for well over a decade. It started as a way to celebrate the birthdays of Don Quinn and Don Bastiano with the traditional fencers’ “birthday smacks.” Originally fencers were expected to fence as many bouts as their age, but a while ago Don Iago upped the ante by requiring the birthday fencers to win as many bouts as their age. This year, that meant 53 bouts won for Don Quinn and 55 for Don Bastiano. In addition to the birthday smacks, the muster focused on melee tactics. 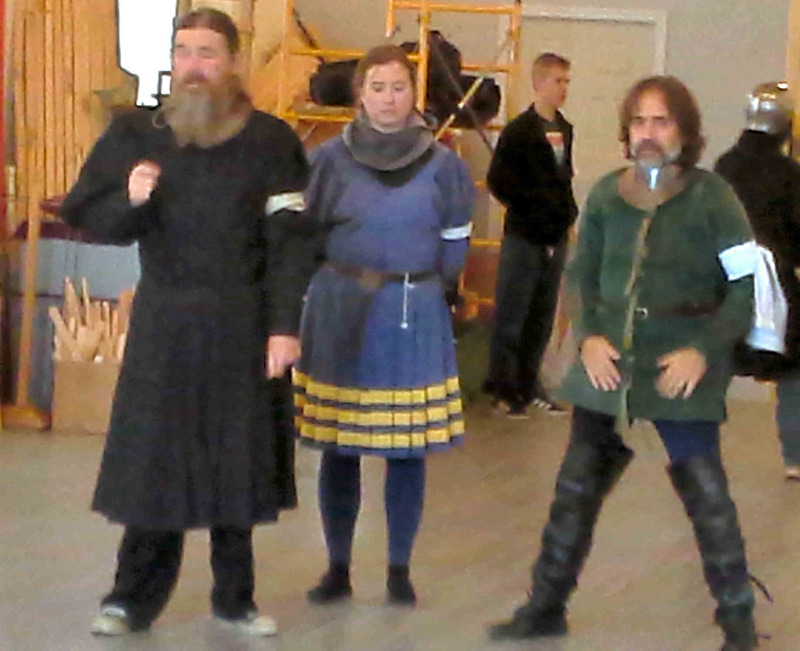 Initially working without masks or blades, the group practiced closed and open unit formations and movement under the tutelage of Don Bastiano and Don Quinn. Then the combatants armed themselves and the outgoing commander of the Southern Watch, Doña Fredeburg von Katzenellenbogen, ran them through melees in 3-, 4- and 5-man units while other White Scarves trained the newer fencers. Over a potluck lunch, Doña Fredeburg said, “It’s about teaching newer fencers the melee basics, so we have a common language of commands and movements.” Doña Emily added, “We all need to be comfortable fighting together.” The group took the opportunity during the break to elect Don Quinn Kerr as the new Southern Watch commander.